The London Olympics have now been and gone, and by most accounts it was a pretty successful one for the New Zealand team, winning six gold medals. It was a successful one for casual sports observers such as myself, too – the competition itself was fascinating – a truly amazing range of physiques and athletic ability were on display. The story behind the last of New Zealand’s medals to be awarded – Valerie Adams’ shot put gold was belatedly presented in an Auckland ceremony on the 19th of September – is a fascinating microcosm of the role of elite athletes in modern capitalist society, and the many-faceted exploitation that is critical for the functioning of the current incarnation of the Olympic Games and modern elite sports in general. Adams finished the competition in second place, behind her Belarusian rival Nadzeya Ostapchuk, only for Ostapchuk to be disqualified days later for returning two positive tests for the banned steroid metenolone. But Adams involvement in the Olympics was already subject to a degree of media sensationalism before she even made her first throw – an administrative mishap by the New Zealand Olympic Committee lead to some doubt as to whether Adams, the defending Olympic champion would even be able to participate. This was gold for the New Zealand media. Very few of their market know the first thing about shot put, so to have so much material to draw on enabled outlets like Fairfax to generate revenue with headlines such as ‘Adams entry blunder needs full NZOC inquiry’ and an out of context photo of a frustrated Adams in support. How often would you normally read an article about the correct forms being filled out for a shot put event? But, by exploiting the general enthusiasm for sports generated by the Olympics hype, this was front page news in New Zealand. The Olympics doesn’t solely generate enthusiasm for sports, and it’s not passion for sports that drives the readership of such articles. As a modern manifestation of interstate competition, the Olympics epitomises nationalism. In today’s neoliberal hegemony this doesn’t play out as a battle of ideology (as it did to a certain extent before the end of the cold war), rather this is a stage for the neoliberal fetish for competitiveness. It’s hard to avoid the rhetoric about events like the Olympics being an opportunity for New Zealand to put its best foot forward on the world “stage (read: market). On the official website of the New Zealand Olympic Committee, the pitiful plea for cash: “If your organization may benefit from the significant branding and promotional opportunities a partnership with the New Zealand Olympic Committee can bring, please contact…” This was further demonstrated in the cringe-inducing manipulation of medal tables – tables adjusted by head of population were popular until the small Caribbean nations started winning track medals and unseated New Zealand from 1st place – and the equally embarrassing comparison with Australia which ended abruptly as soon as they overtook us on the medal table. The stakes are much higher for some countries than they are for New Zealand. New Zealand is reasonably affluent on the whole, and already has access to a number of valuable trading partners (though like all neoliberal states we’re obsessed with ever greater and unimpeded access to these markets). Belarus though, is largely dependent on its relationship with Russia, and foreign relations are strained by its poor record on human rights and historical membership of the USSR. But competition is coercive – just as the most kind-hearted individual capitalist is forced by competition and the necessity of “competitiveness” towards the lowest common denominator, so do individual national sporting bodies seek competitive advantage, and so too do individual athletes seek competitive advantage. Viewed in this way, it is not the behaviour of the individuals working within the system that is to blame, but the class to which they belong, and so it is the system itself that inevitably creates “drug-cheats” That is to say, nationalism is a tool of neoliberal capitalism – and athletes become a tool of the industry of professional sport. Depending on the requirements of the particular sport, the dimensions of these athletes can be well outside the bell curve, with spectacular effect. It’s these unusual characteristics that are sought out and cultivated by the multi-billion dollar transnational industry of consultants, trainers, managers, advisors and experts, and by national sporting bodies. Of course the result is fantastic for casual sports viewers like myself, and surely contributes significantly to the popularity of the Olympics. The very strength of athletes is also their vulnerability. Elite athletes are drawn from groups within the population that are atypical of prevailing norms – and being a member of an â˜other’ group exposes sportspeople to a level of scrutiny that to most of us would seem abhorrent. The public and official scrutiny of runner Caster Semenya’s gender after her 2009 world championship gold medal is case in point. The media plays a significant coercive role in shaping the discourse around gender, ethnicity and nationality, and thus maintaining these capitalist power structures as they apply to sportspeople. One crude example of this is the way news websites like Stuff, (and to a still greater extent, talkback radio) seem to operate by planting the seed in the body of the article and letting the trolls take it to its logical conclusion in the comments section. Thus they get to keep their hands relatively clean, and still have the benefit of the outrageous content. 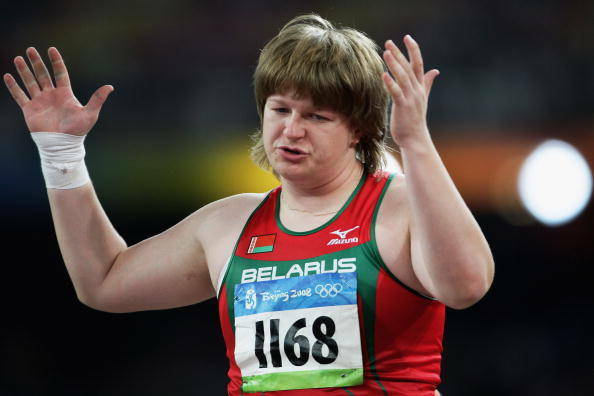 In the context of Adams’ belated gold medal, nationalism has been fairly blatantly used as an excuse to vilify Ostapchuk for her masculine appearance and Eastern European tendency to take illegal performance enhancing drugs. The media exposes the dark side of sports in New Zealand too – for example the Blues super rugby franchise suffered a disappointing 2012 season, and being the only team with a Polynesian coach, Pat Lam, a disproportionate amount of â˜analysis’ focused on his ethnicity. Lam tearfully acknowledged the impact of racist taunts in a press conference in April. Despite the above criticisms, I believe that the vast majority of people involved in elite sports administration and competition are there out of a love for their sport – which makes it all the more distressing that the inevitable corruption of capitalism is so obvious in this arena. The amazing physiques, abilities and dedication of the athletes involved is worth so much in its own right, without being constrained, distorted and sullied by opportunistically deployed social constructs such as nationality, race, and gender. Yes, so where do we go from there? A big socialist movement would have the capacity to promote inclusive mass sport projects for working class youth. Given the absence of that, what are some socialist demands on the prevailing authorities for something approaching that? Or, within the limits of our present resources, what initiatives might be achieved without sponsorship from below? A few years back I tried to get up a class challenge to the corporate running teams, a union team for a half marathon event in Wellington. “Workers should be running the country!” printed on each one. Didn’t come together at that time but my dream is not yet dead.